In 2016 Wick Voices, the Wick Society's Oral History Section, embarked on an ambitious, long-term project aimed at collecting and preserving memories and information from the past. During the Caithness International Science Festival, through the use of ‘Talking Tiles,’ the aim is to create an interactive map giving information and stories about the history and heritage of John O’Groats. Learn about the technology of sound recording. View wonderful film photography, highlighting the night skies of Caithness and in particular the Northern Lights (aurora borealis). Wonder at this natural phenomenon. Explore the links between science and art. Discover and explore Caithness through this ‘Dawn to Dusk’ photographic slideshow. Whether you visit well known attractions or investigate hidden Caithness, you will be amazed at the wide skies and changing light. Explore the light and colour of sunrises and sunsets. The Johnston Photographic Collection represents the work of three generations of Caithness photographers who captured images of life in and around the area between 1863 and 1975. During that period, they produced around one hundred thousand glass plate negatives. Of these, around fifty thousand survive and are held in trust by the Wick Society. John O’Groats Mill is the last mill in Caithness to retain its machinery and fittings. Through audio and film listen to Rogni Brown describe the technology associated with the milling process and the workings of the water wheel. Through audio and film learn about the science of brewing. 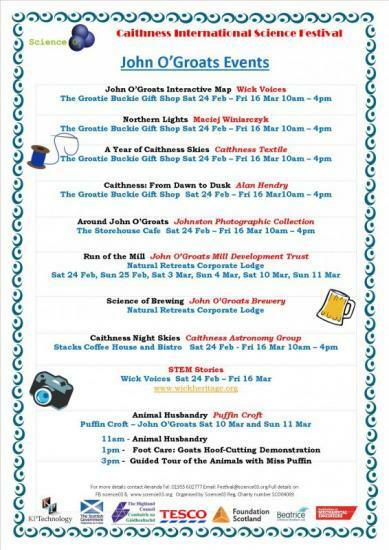 The Caithness Astronomy Group's aim is to continue to promote and support local interest in space and astronomy. Marvel at the spectacular photography of Caithness night skies. Marvel at the wonders of the night skies. Wick Voices aims to interview people from Caithness who have made a career in the STEM subjects of science, technology engineering and maths. We are currently looking for volunteer interviewees. Visit Puffin Croft petting farm, as seen on T.V. Meet rabbits, goats, pygmy pigs, chickens, geese and donkeys. A brilliant experience for the whole family so come prepared with appropriate clothing! Learn about the science of breeding and taking care of farm animals.